Put flour, sugar and salt in the bowl of a food processor and pulse to mix. Add butter and pulse until mixture is coarse. Add 1/4 cup of water and pulse just until moistened, then add water 1 T. at a time and pulse just until mixture holds together when pinched. Dump the crumbly mixture onto a pastry mat and bring it all together, pressing it into a flat mass. Roll it over on itself, pressing into a block, then wrap tightly and chill for an hour or until ready to use. Set the chilled pastry on a floured pastry mat. Cover with a sheet of plastic wrap and bang with a rolling pin to flatten it into a circle. Roll into a large (12 inch) circle. Transfer to a 9 inch pie dish. Preheat the oven to 400 degrees. Mix sugar, cinnamon and flour. Toss apples with lemon juice and sugar mixture. 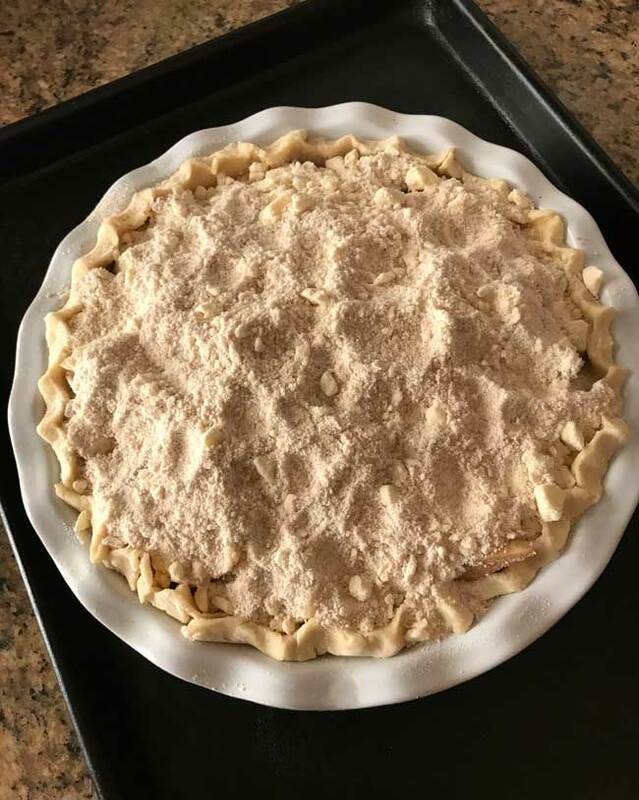 Transfer filling to unbaked pie shell and set it on a rimmed baking sheet. Prepare topping. Put both sugars, salt and flour in a food processor. Add chunks of butter and pulse until crumbly. Sprinkle over apples. Set pie on a baking sheet and bake for 45-50 minutes or until golden. Let cool for several hours before serving. It'd hard to measure apples by the cup, so I weighed each cup and found that each cup of apples weighed around 3 to 3.3 oz, so I used somewhere around 18 oz and probably thew a few more apple slices in at the end. I cut the apples into thin slices, then cut each thin slice into 2 or 3 chunks.